The other day, while out checking something on the kitty, I noted in horror that there was a clear sign that there was a coolant leak under my XJSC. Today, I jacked it up to examine where the leak might be coming from. Here are some pix of what I saw. Sorry they're not great -- the space doesn't give the best clearance for good angles, and lighting is poor at best. 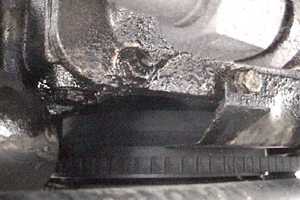 The crankshaft pulley was dry, although the coolant found to be dripping from one of the two bolts below it. My best guess is that it is running down from somewhere (bottom edge of the water pump?) along the face of the engine block. 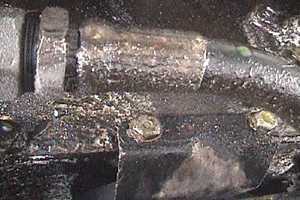 The two bolts near the centre of this pic are where most of the cooltant was dripping from. 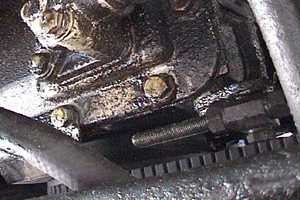 The hose running along the top edge of this was catching some of the coolant dripping down on it from the two bolts. Coolant was also found to be dripping off of the oil pump, although this is really because the car was jacked from the LHD driver side, and therefore had a significant tilt towards the oil pump. 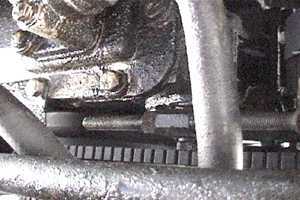 Stuff to the right of the engine compartment from the oil pump was dry. 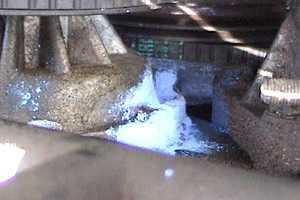 I dusted the visible area around the water pump (this shot from above) with powdered chalk, which would have gotten damp (moreso than the cling to the oil) had there been an active leak running over it. This bit here didn't get wet -- but there is plenty of area I couldn't reach, much less even see.